AMC today announced that it had ordered a second season of the drama Halt & Catch Fire, a show that attracted a committed core audience and notable critical acclaim across its initial season. The show will return to AMC next summer. Here's what AMC President Charlie Collier had to say about the renewal in a statement. "This is a show about invention, experimentation, and the inherent risks in trying to break new ground - themes that really resonate with us as a network and attracted a passionate audience. We have a history of demonstrating patience through the early seasons of new shows, betting on talent and building audience over time. 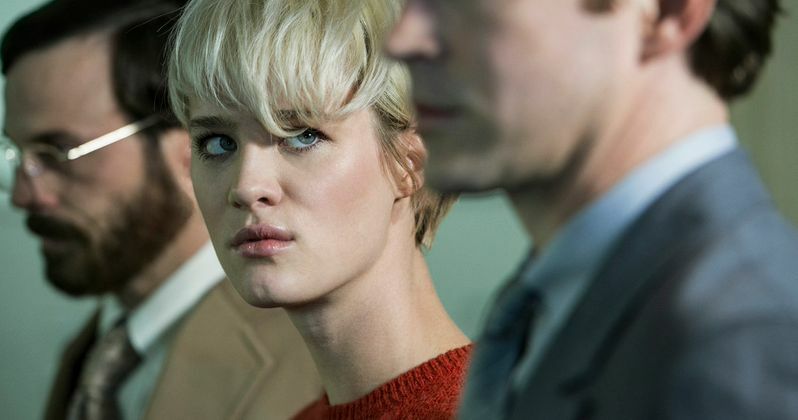 We see that opportunity here and look forward to a second season of Halt & Catch Fire from creators Chris Cantwell and Chris Rogers, and showrunner Jonathan Lisco." Here's what executive producers Chris Cantwell and Chris Rogers, and showrunner Jonathan Lisco had to say in a joint statement. "We're thrilled to have the opportunity to continue telling this story. Our series about creation, innovation, and taking bold risks wouldn't be possible if it weren't for our partners at AMC, a network known for these very things. Harnessing the momentum of our first season, this next chapter will take the rich characters our audience has come to love in new and surprising directions." According to Nielsen data, the first season of Halt & Catch Fire was one of the most upscale dramas on ad-supported television, #3 among adults 18-49, behind Mad Men and The Good Wife, and #4 among adults 25-54, behind Mad Men, The Good Wife and Parenthood. It was also one of cable's most engaging dramas among adults 18-49 (#3) and adults 25-54 (#4), according to Nielsen TV Brand Effect. From AMC Studios, Halt & Catch Fire captures the rise of the PC era in the early 1980s, focused on four primary characters attempting to innovate against the changing backdrop of technology and Texas' Silicon Prairie. The series was created by Chris Cantwell and Christopher C. Rogers and executive produced by Cantwell, Rogers, showrunner Jonathan Lisco (Southland) and Gran Via Productions' Mark Johnson (Breaking Bad, Rectify, Diner, Rain Man) and Melissa Bernstein (Breaking Bad, Rectify). Main characters include Joe MacMillan (Lee Pace), Gordon Clark (Scoot McNairy), Donna Clarke (Kerry Bishé), Cameron Howe (Mackenzie Davis) and John Bosworth (Toby Huss). Halt & Catch Fire is distributed internationally by Entertainment One Television (eOne), through an exclusive multi-year output agreement.